A lot of ink has been spilled in the wake of Brian Burke’s firing. His personality, win-loss record, failure of the Leafs to make the playoffs, or perhaps his potty mouth have all been blamed. Smarter guys than us will continue to chase the story. There is a single undeniable element of Burke’s legacy, one borne from love, that trumps any stat, banner or award. 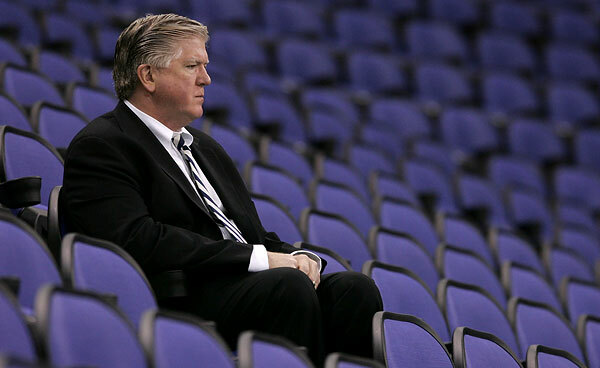 Brian Burke manned the barricades both before and after the loss of his son. Chapters of this legacy will be written for years to come, no matter what day job he ends up with, at another team or the NHL. We owe a personal debt of gratitude to Brian Burke. There would’ve been a silly gay hockey blog no matter what, but through his and Patrick’s hard work we feel this enterprise is a part of something bigger – something that touches and improves lives. We also love any guy that swears like a Prussian artillery officer. I never liked Brian Burke. That is until his son Brendan came out. I read the statements of support and genuine love that he had for his son and I was genuinely touched that this man with a gruff Archie Bunker exterior, this ‘man’s man’ as the old timers say (But why? It’s so icky sounding), would immediately say “This doesn’t change a thing.” Brian Burke exudes that working class tough guy demeanor. I mean, look at him. He looks ready for a road company of Glengarry Glen Ross. It proved that “family values” isn’t just some hollow slogan or rallying cry against homosexuality, but an actual concept about standing up for who you are and what you believe is right. That’s one of the reasons I was so disheartened to see so many homophobic, vitriolic, and let’s face it, childish comments on Twitter upon his firing. ( I was looking for another adjective ending in ‘ic’, but in honor of Burkie’s no-nonsense attitude, I decided against making too “cute” a play) Some even made a comment about how all his work for charities and the LGBT cause meant nothing. But again, we all know that’s not true. I hear commentators always discussing conduct ‘on and off the ice’ with players and that’s no different with coaches, owners or GMs. When Brian Burke marched in the Toronto Pride Parade, I, who have occasionally been accused of not having an emotional soul, wept just looking at the photos. Had I actually been there, it would’ve been the ugly cry. He marched even without Brendan which was must have been tough for him, but throughout it he maintained his default look that to me always reads “I need more Mylanta”. I’m sure he’ll end up with some other team I despise (after his stint as ‘consultant’), but I will always have enormous respect and admiration for him for being such a fantastic and important ally to our community. After Brendan Burke died, I wrote in my blog, “Personally, it is the most I’ve ever been affected by the passing of someone I did not know.” His story captivated me, because in many respects, I related to him. Close to the same age. In college in Ohio. Sports loving. Gay. I never felt as courageous as him and never had to be out in such a national, public way. I respected him so much for that and hoped, so much, to see how it would affect “the cause”. Unfortunately, the script changed far too quickly. Brendan tragic passing changed the course of the influence. It could have completely stifled it, and you know what, nobody would have blamed Brian or any of the Burkes. That they have fully embraced the effort, even as painful of a reminder as it may be, is a testament to the strength and commitment of that family. And, naturally, much of that had to have been instilled by Brian. From the pride parades to interviews to speaking out against bullying to You Can Play, the impact that Brian and the Burkes have had is immeasurable. Just as I cannot truly and fully empathize with their loss, and no number or choice of words could capture such emotion, they too will never be able to truly understand our appreciation for the work they have done and continue to do. I hope one day to meet Mr. Burke to shake his head and thank him. The business of sports is tough. Players, coaches, front office folk all come and go, but few make such great impacts outside of their organization like Brian Burke (Ed Snyder comes to mind in Philadelphia for his commitment to youth development). When Brendan Burke came out, Brian became a very public example of a sports celebrity working through the issue of being a prominent figure in a traditionally masculine arena with a gay son. His acceptance is something that should be admired and replicated, however, and should continue to serve as an example of tolerance and acceptance wherever he may land in the NHL. As a non-Leafs fan living in Toronto, Brian Burke’s record with the Leafs didn’t bother me too much. Sure, a lot of my friends are morose as the Leafs missed the playoffs for yet another year but hey, it’s not like it was any better under JFJ or Cliff Fletcher. So my lasting memory of Burke’s time with the Leafs won’t be related to the hockey teams he put on the ice at the ACC. Instead, it will be Pride weekend in 2011, shortly after I’d moved back to Toronto. The day of the Pride parade was obscenely hot, with blazing sun. Many of the parade participants, quite sensibly, were wearing little more than sparkly gold hot pants. The biggest cheers of the day, though, weren’t for the scantily-clad go-go dancers gyrating to Born this Way, or for the absolutely fabulous drag queens. No, they were for the grey-haired man marching with PFLAG, wearing a Leafs jersey with “Brendan” on the back. Why is this important? At least in the group I attended with, I was pretty much the only guy who’d been to an NHL game. My boyfriend leaves the room whenever I change the channel to TSN. While obviously there are plenty of LGBT people who love hockey (hey, that’s what Puckbuddys is about! ), it hasn’t struck me as something that the gay community as a whole in Toronto is massively enthusiastic about. Yet everybody knew who Burke was. Everybody knew why he was marching. And everyone appreciated it. Some things transcend whether or not you give a crap about the Leafs, or hockey, or sports in general. The symbolism of the GM of one of the most iconic institutions in the city reaching out to the LGBT community was incredibly powerful. But Burke didn’t stop at symbolism. By helping found You Can Play, he’s actively improving life for gay athletes everywhere. I’ll be sad to see him go. He’s the stereotypical hockey guy – tough, brash, and highly opinionated. Yet when you peel back those layers, you find a grieving father who did whatever he could to keep the legacy of his son’s life alive. What Brian Burke did for both the LGBT and Hockey community is nothing short of amazing. Brian stood up against bully’s and anyone else who made life difficult for gay players or youth. He inspired gay kids to be proud of who they are and to have no fear in lacing up the skates. He inspired parents to put aside their discomfort in order to learn, love and accept their kids unconditionally. Afterall, if a guy like Brian Burke can love and support a gay son – why can’t everyone else? So while he may not have led a long awaited Stanley Cup parade down Younge Street, he did lead a Pride Parade – and to some, that’s even bigger than Lord Stanley’s Cup. I really can’t put into words the thoughts and emotions that run through my head every time I hear that name. I have been sitting here at my computer, trying to write about my personal opinions of Brian Burke, for well over a half hour now, and this is as far as I have gotten. Not because I have a wide range of thoughts about him, but because every time I try to type something out, it just seems like it doesn’t do him justice. I love Brian Burke. I love Brian Burke in the way that a Pee-Wee center from Chicago loves Jonathan Toews, or a young goalie from New Jersey loves Martin Brodeur – I idolize the man, for all the great things he has done for the game of hockey, both in and out of his GM’s office. Also, his work on the 2010 United States Olympic team was nothing short of legendary. I’ve always respected Burke for his work as an elite General Manager, partly because he is a fellow American, but also because I applaud his no-nonsense approach to the job. He is one of the few General Managers who doesn’t allow outside pressure affect his decisions, and each year he does whatever it takes to try and win the Stanley Cup. Any fan of his teams has to appreciate his ambition. He is a competitor, and looks at each day as a new opportunity to make his team better. But after learning about Burke teaming up with his son Patrick to establish the You Can Play Project, my respect and admiration for him grew exponentially. Here was the General Manager of the Toronto Maple Leafs, arguably the most famous hockey franchise in the world, becoming an outspoken advocate for equal opportunities for gay athletes. I never imagined in a thousand years that I would see the day something as incredible as this movement would become a reality. So as you can imagine, I was extremely disappointed to discover that the Toronto Maple Leafs decided to relieve Burke of his General Manager duties. I am in no way a Toronto Maple Leafs fan, but I would have liked to see if this year’s Burke-created team could have taken advantage of the shortened season to make a run at the playoffs. Burke is a proven winner in every aspect of the word, and I personally feel he deserved a chance to let this season play out. In no way is this the last time we will see Burke in a General Manager’s role, but I believe he has already cemented himself an incredible legacy that no other NHL executive could ever match. He owns a Stanley Cup ring, an Olympic silver medal, and proudly bears the responsibility of pioneering a new era of professional sports, where gay athletes can be free to play the sports they love at the highest possible level. To me, Brian Burke is so much more than an elite NHL executive: he’s a hero. This entry was posted in Heroes and tagged Brian Burke. Bookmark the permalink. 3 Responses to …it’s how you play the game. Burke will find another gig. Im shocked they let him go… Especially right now. Timing doesnt make sense. For this alone, I like Burke (and his son Patrick as well) and hope he finds another job soon. i never really gave much thought to brian burke.. i mean he took the ducks to the stanley cup finals and won.. well before the kings could do the same.. but after his son came out, and later when brendan tragically passed away i grew to love brian burke.. and patrick.. inspite of the fact that he works for the arch rival of my beloved penguins.. they are good people.. they are hockey people.. they are my people..